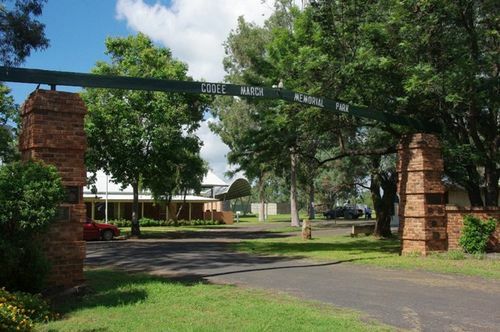 A bricked gateway with wooden arch commemorates the Cooee March from Gilgandra during World War One. Following the disaster of Gallipoli and the heavy casualties in France in the latter half of 1915, recruiting figures for enlistment in World War One had dwindled. Numerous recruiting rallies became increasingly ineffective. 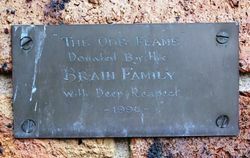 It was at this dark hour that Gilgandra's butcher, R.G. Hitchen and his brother Bill, the local plumber, had the idea of organising a route march of volunteers to Sydney, enlisting recruits as they marched. 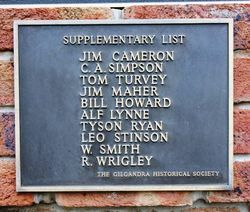 Twenty six men left Gilgandra, a western town on the Castlereagh River. They were feted at each town on the route, and the stirring story of their march has become part of the official war history of Australia. Recruitment meetings were held in each centre and their number increased to 263 by the time they reached Sydney. On Sunday 10th October 1915. On October 10th 1915, a recruiting march left Gilgandra calling at each town and village gathering volunteers. They marched into Sydney on 12th December as 277 recruits for the army. It was the original and most successful of nine such marches. 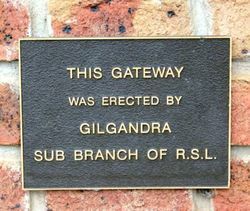 This park provided by Gilgandra Shire Council and developed by the service clubs and community organisations of Gilgandra was officially opened on the 26th January 1987 by Councillor A.M.McGrane. Shire President, Gilgandra Shire Council.